Forecast: Urban Light is worth a bit of a gamble in today’s opener, a contentious first-level allowance downhill turf sprint for 3-year-olds. The D’Amato-trained colt makes his U.S. debut after a flashing promise in useful handicap races last year in Ireland and based on his local workouts he could be a better type as a 3-year-old. He’s a first-time Lasix user with a good closing kick. Florida shipper Onthewaytonevrland, a nice maiden winner in December and sporting a bullet five-furlong workout last week over the local main track, is a strong fit on figures and should snjoy an ideal stalking style for this course. Prat takes the mount for Ward. We really can’t eliminate Vantastic, even though the son of Dialed In just failed at 60 cents on the dollar when second in a similar affair last month. His maiden win over this course and distance last fall charts well here. Forecast: Papa Turf has been popular at the claim box lately and today goes for the Metz stable after finishing a strong second in a $12,500 affair last month. He’ll leave from the comfortable outside post today and should inherit a soft pace-stalking trip and have every chance. Stringent just edged Papa Turf when they met in that Jan. 19 affair and could win again. The son of Lemon Drop Kid has won four of nine career starts over the Santa Anita main track, retains Bejarano, and likely will enjoy a soft stalking trip. We won’t split hairs, so both will be included in our rolling exotic play. 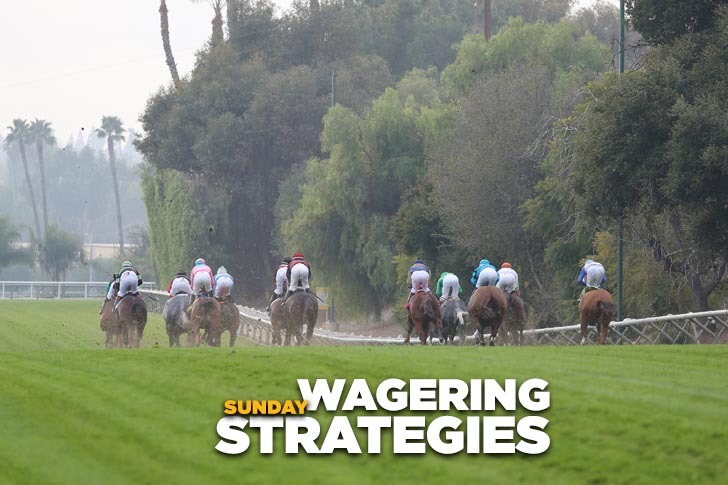 Forecast: ​This bottom-rung maiden $16,000 abbreviated sprint for older horses has nothing in it to trust, so we’ll go three-deep in our rolling exotics while otherwise passing the race. Getaloadofthis has the route to sprint angle we like and numbers that fit. He’s the top pick by default. Iron Curtain is an 11-race maiden and Captain N. Barron has failed 16 times, but both have gotten close a number of times so they can’t be ruled out. Captain N. Barron will be racing without blinkers for the first time, so that may help. Forecast: Trappiza is 1-for-14 in her career but at least that one win came over this main track two runs back. This stretch out to a mile should help, and she gets a huge break in the weights with the switch to bug boy Diaz, so in a weak affair we’ll put the daughter of Trappe Shot on top. Cee Sam’s Girl has no tactical speed but against this group should be able to produce enough of a late bid to at least hit the board. However, she’s been beaten as a short-priced favorite in her last pair and clearly needs a pace meltdown to have her best chance. Let’s try to get by using just these two but if you feel the need to spread deeper, go right ahead. Forecast: Older $20,000 claiming fillies and mares sprint five furlongs in a grass grab bag that offers several possibilities. We’ll try to survive and advance using just two. Red Shelby is a first-off-the-claim for Hollendorfer while making her second start off a layoff and returning to grass. She won a five-furlong turf sprint at Del Mar last summer and should take some catching today. Swirling has no early speed and may find this trip a bit sharp, but she plummets drastically in class, gets in with a feather, and has several prior speed figures that would bury this group. But after fading badly when well-backed vs. allowance types last time and being tossed away today, her condition must be questioned. Forecast: ​Bottom-rung 3-year-old maiden claimers meet over a mile in the sixth race. Anything goes. Rockandahardplace is re-equipped with blinkers and gets Lasix for the first time while dropping to his lowest level ever, so there’s reason to believe he can improve. Tanker stretches out again and should improve at this trip. Caribbean Colors was beaten nearly a sixteenth of a mile in his debut in a straight maiden event. This crew is considerably softer, so big improvement is likely. Use as many as you can afford to in rolling exotic play. Forecast: Apache Princess was visually very impressive in a recent downhill turf course allowance win that came on the heels of her sharp maiden score over this course and distance the previous month. Three in a row seems well within her range despite the rail draw and the step up into listed stakes company. Ginger Nut makes her U.S. debut for Sadler with a string of works that should have her plenty fit. Her form last year in England was decent, not great, but she gets Lasix, Rosario, and an ideal outside draw. We’ll prefer Apache Princess on top but use both in our rolling exotics. Forecast: Coliseum is back sprinting where he belongs and should regain his best form. A repeat of his runaway, highly-rated maiden win is all he’ll need to get back on track. At 6/5 on the morning line he’ll be too short to play in the straight pool, but we can use him as a no-value rolling exotic play. Forecast: Spy Ring may have been an unlucky loser when third with traffic trouble in a similar Hillside turf sprint last month in what was her first outing since last June. With that effort behind her and with clear sailing today the Cassidy-trained mare should be along in time. Fiery Lady, third in the Sunshine Millions Filly & Mare Turf Sprint over this course and distance, returns to the allowance ranks today, switches to Smith, and should be a major player from off the pace. Helen’s Tiger, runner-up in two of her last three starts, may lack a winning punch but she should at least hit the board and is worth tossing in on a ticket or two in rolling exotic play.